In just six hours of December 26th MSNBC mentioned Russia twice as many times as it had mentioned Yemen in entire 2017! In 2017, MSNBC ran 1,385 broadcasts that mentioned “Russia,” “Russian” or “Russians.” Yet only 82 broadcasts used the words “Yemen,” “Yemeni” or “Yemenis” in the entire year. Moreover, the majority of the 82 MSNBC broadcasts that mentioned Yemen did so only once and in passing, often simply as one nation in a longer list of nations targeted by President Trump’s travel ban. Of these 82 broadcasts in 2017, there was only a single MSNBC news segment devoted specifically to the US-backed Saudi war in Yemen. On July 2, the network ran a segment on Ari Melber’s The Point (7/2/17) entitled “Saudi arms deal could worsen Yemen crisis.” The three-minute broadcast covered many of the important points about US support for the catastrophic Saudi war in Yemen. Yet this informative segment stood alone in the entire year. A search of the Nexis database and the Yemen tag on MSNBC‘s website shows that, in the approximately six months after this July 2 broadcast, the network did not devote another segment specifically to the war in Yemen. 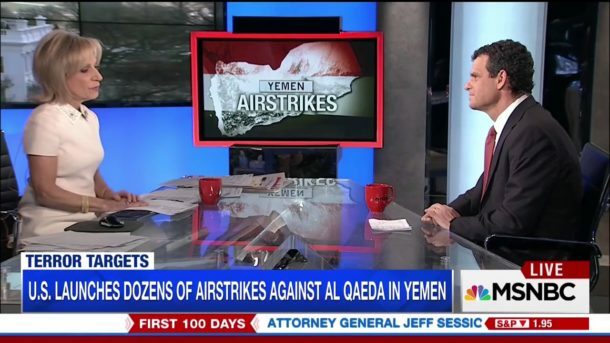 A search of MSNBC broadcasts also shows that, while the network would sometimes within the same broadcast mention both Yemen and airstrikes, it did not—aside from Ari Melber’s lone segment—acknowledge the existence of US/Saudi coalition airstrikes on Yemen. The closest the network otherwise came was in a March 31, 2017 segment on the Last Word With Lawrence O’Donnell, in which Joy Reid said, “And as the New York Times reports, the United States launched more attacks in Yemen this month than during all of last year.” But Reid was referencing a New York Times report (3/29/17) on US airstrikes on Al Qaeda in the Arabian Peninsula (which numbered in the dozens), not US/Saudi coalition airstrikes on Houthi-controlled territory in Yemen (which numbered in the thousands). While ignoring the US/Saudi coalition airstrikes and the thousands of civilians they killed, however, MSNBC did report on Houthi attacks on Saudi warships off the coast of Yemen. In his show MTP Daily (2/1/17), Chuck Todd favorably covered the anti-Iran posturing of Trump and National Security advisor Michael Flynn. He misleadingly spoke of the Houthis as Iranian proxies and gave former US diplomat Nicholas Burns a platform to claim, “Iran is a violent troublemaker in the Middle East.” On February 1 and 2, Chris Hayes also reported on the Houthi attack. MSNBC was eager to highlight attacks by US official enemies, yet the tens of thousands of air sorties Saudi Arabia has launched in Yemen—with weapons, fuel and intelligence from the US and UK—were made almost entirely invisible by the network. Years of US/Saudi coalition bombing and blockade of Yemen likewise decimated the poor country’s health system, plunging it into a cholera epidemic that has killed thousands of people and broken all previous records. MSNBC did not once acknowledge this catastrophe either, according to a search on Nexis and MSNBC’s website. Cholera was only mentioned on MSBNC in 2017 in the context of Haiti, not Yemen. While MSNBC did not bother to mention Yemen’s cholera epidemic, it did express lots of interest in a disastrous Navy SEAL raid President Donald Trump approved in the country, which left an American dead. Particularly early in the year, the network devoted substantial coverage to the January 29 raid, which killed dozens of Yemeni civilians and one US soldier. A search of the Nexis database shows that MSNBC mentioned the Trump-approved US raid in Yemen in 36 distinct segments in 2017. All of the network’s major shows produced segments that focused on the raid: MTP Daily on January 31 and March 1; All In on February 2, February 8 and March 1; For the Record on February 6; The Last Word on February 6, 8 and 27; Hardball on March 1; and the Rachel Maddow Show on February 2, February 3, February 23 and March 6. But after this raid left the news cycle, so too did Yemen. A search of Nexis and the Yemen tag on the MSBNC website shows that, excluding Ari Melber’s lone July segment, the latest segment MSNBC devoted specifically to Yemen in 2017 was the Rachel Maddow Show‘s March 6 report on the SEAL raid. The message conveyed is clear: to the leading liberal US cable news network, Yemen is relevant when it is Americans who die—not when thousands of Yemenis are killed, bombed daily by Saudi Arabia, with US weapons, fuel and intelligence; not when millions of Yemenis are on the verge of starving to death while the US/Saudi coalition uses hunger as a weapon. The conclusion that only Americans’ lives are newsworthy is confirmed by the fact that Trump launched another disastrous raid in Yemen on May 23, in which several Yemeni civilians were once again killed. But American soldiers did not die in this raid, so MSNBC had no interest. The network did not devote coverage to this second botched Yemen raid. According to a Nexis search of the network’s broadcasts from January 1 to July 2, 2017, “Yemen,” “Yemeni” or “Yemenis” were mentioned in 68 MSNBC segments—nearly all of which were related to the SEAL raid or the list of countries targeted by Trump’s Muslim ban. In the approximately six months from July 3 through the end of December, the words “Yemen,” “Yemeni” or “Yemenis” were only uttered in 14 segments. In most of these segments, Yemen was mentioned just once in passing. 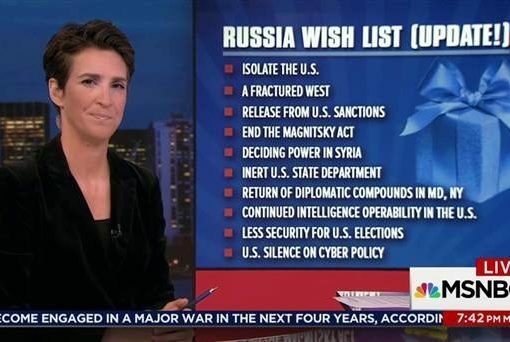 In this same 181-day period in which MSNBC had no segments devoted specifically to Yemen, the terms “Russia,” “Russian” or “Russians” were mentioned in a staggering 693 broadcasts. This is to say, in the latter half of 2017, MSNBC aired 49.5 times more—or 4,950 percent more—segments that spoke of Russia than segments that spoke of Yemen. 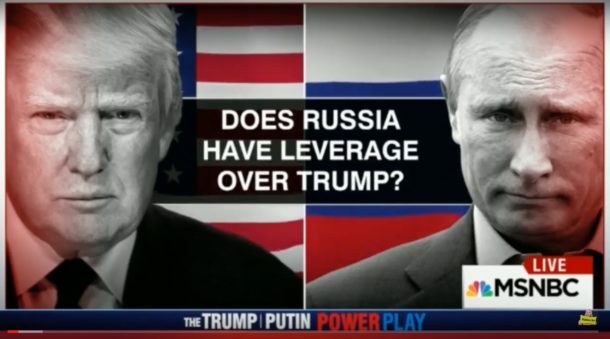 In fact, in the four days from December 26 to December 29 alone, MSNBC said “Russia,” “Russian” or “Russians” nearly 400 times in 23 separate broadcasts, on all of the network’s major shows, including Hardball, All In, Rachel Maddow, The Last Word, Meet the Press Daily and The Beat. On this one day, MSNBC mentioned Russia almost twice as many times in six hours of coverage than it mentioned Yemen in all of 2017. While MSNBC did not have a segment devoted specifically to the war in Yemen other than Ari Melber’s lone July broadcast, the country was sporadically mentioned in passing. Chris Hayes briefly acknowledged Yemen a few times, although he did not devote a segment to it. In the May 23 broadcast of All In, the host did point out, “We have been arming and supporting the Saudis as they pursue a proxy war in Yemen against Shia rebels, the Houthis.” Aside from the fact that the supposed Saudi/Iran proxy war in Yemen to which Hayes apparently alludes is a misleading talking point that has been fueled by the US government and intelligence agencies and obediently echoed by corporate media (FAIR.org, 7/25/17), Hayes still did not recognize the US/Saudi coalition airstrikes that have killed thousands of civilians. In a June 29 interview on All In, Palestinian-American activist Linda Sarsour additionally spoke out on behalf of “Yemeni refugees who are victims of a proxy war that we’re funding.” Hayes added, “Who are starving to death, because we’re essentially funding the Saudis to hold them under siege.” This was the rare moment in which MSBNC acknowledged the Saudi blockade of Yemen—but, again, no mention was made of the US-backed Saudi airstrikes that have killed thousands of Yemenis. On July 5, Chris Hayes spoke using extreme euphemisms, stating, “Since taking office, the president has been swayed to take Saudi Arabia’s side in its dispute with Yemen.” Looking beyond the fact that “dispute” is an outrageous understatement for a brutal war that has led to the deaths of tens of thousands, Hayes failed to point out that former president Barack Obama, like Trump, staunchly supported Saudi Arabia as it bombed and besieged Yemen. Rachel Maddow also again briefly mentioned the botched January US raid in Yemen in her broadcasts on April 7 and 24. So too did Hayes on October 16. It is interesting, Tom, that the president seems to have these Gulf State allies. He is giving them basically carte blanche a little bit on what they’re doing in Yemen, is sort of looking the other way. But that is it. Aside from Ari Melber’s one-off July segment, in 2017 MSNBC had no other coverage of the US-backed war that has created the largest humanitarian catastrophe in the world. What is striking is that MSNBC is clearly extremely critical of Donald Trump, yet it has passed on one of the best opportunities to condemn his policies. Instead of covering some of Trump’s worst, most violent actions—his acts of war that have left many thousands of civilians dead—MSNBC has ignored Trump’s Yemeni victims. Perhaps this is because it was a Democratic president—Barack Obama, a favorite of MSNBC—who first oversaw the war in Yemen for nearly two years before Trump entered office. But MSNBC‘s right-wing rival, Fox News, has shown again and again that it has no problem attacking Democrats for doing what Republicans did before them. Media Stops Calling Trump a Nazi. What's Going on?